There are few things in life better than a glass of sparkling wine. It is the perfect accompaniment to a celebration of one of life’s success and it’s bubbles can lift our spirits when we are down. However not all sparkling wines are created equally. Although it is produced almost everywhere wine is produced, in the US, we are most familiar with Champagne, Prosecco, and domestically produced sparkling wine. Champagne is the absolute king of sparkling wine. It is produced only in the Champagne region of France, following strict guidelines, and using a limited number of grape varietals. The primary varietals used are Chardonnay, Pinot Noir, and Pinot Meunier. A Champagne made exclusively from Chardonnay (or other allowed white skinned varietals) is labeled “Blanc de Blanc” or “white from white”. “Blanc de Noir” or “white from black” means that the Champagne is made from dark skinned or what we might call “red” varietals like pinot noir or pinot meunier. When using a dark varietal, the grapes are crushed more gently and the skins are separated quickly. Rose Champagne is allowed more skin contact and therefore picks up some color- the darker the rose, the more skin contact is allowed. Champagne gets its bubbles through a process called methode traditionelle, formerly known as methode champenoise. In this method, the wine is fermented first in a barrel. A small amount of sugar and yeast are added when bottling and a second fermentation occurs. The products of fermentation are alcohol and carbon dioxide. Since the bottle is capped, the carbon dioxide is forced into the wine and creates the bubbles we so love. The bottles are stored on their sides and as the yeast ferments the sugar, it starts to clump together and collect on the side of the bottle. As this is happening, the bottles are turned slightly every day which causes the spent yeast to collect at the top of the bottle. This process is called riddling. Once all sugars are fermented and the yeast has totally collected at the top of the bottle, the very tip of the bottle containing the yeast sediment is frozen, the cap is removed and the frozen yeast is expelled due to the pressure from the now carbonated wine. This process is known as disgorging. In the final step of the process, a mixture of sugar (called dosage) and finished champagne is added to make up the volume of yeast that was disgorged. The amount of dosage differs. The sweetest Champagnes are labeled Doux, followed by Demi-Sec, Dry, Extra Dry, Brut, and Extra Brut. If no dosage is added the Champagne is labeled Brut Zero or Brut Nature. Methode traditionelle can be followed by a vintner anywhere- for example Cava is Spanish sparkling wine made following methode traditionelle. Wine made in France outside of the Champagne region that follow methode traditionelle are frequently called Cremant. For example, Cremant de Loire is made mostly from Chenin Blanc in the Loire Valley. Prosecco, the Italian sparkling wine that conquered brunch, is made in northern Italy and uses the Charmat or Metodo Martinotti. Under the Charmat method, secondary fermentation takes place in large pressurized stainless steel tanks. Once fermentation is complete, the carbonated wine is filtered and bottled. This method is much more cost effective than the methode traditionelle. Prosecco is made from from mostly Glera grapes but may include other varietals including Pinot Grigio, Chardonnay, Pinot Bianco, and Pinot Noir. Process can vary in sweetness from Dry, Extra Dry, to Brut. The least expensive method of producing sparkling wine is though injecting carbon dioxide into still wine in the same manner used in soda production. The wine produced is sparkling, but generally not of very high quality. Chances are if you are drinking bottomless mimosas at your local brunch spot or if the bottle is topped with a plastic stopper, you are enjoying sparkling wine made using the soda method. Perhaps the most important important part of enjoying sparkling wine is opening the bottle. Most sparklers are topped with a cork that is held in place with a wire cage (muselet). Virtually all wire cages are secured in place by a wire loop that must be twisted six times, counter clockwise to be removed. Why six? Who knows, but six turns is a global standard. Once the wire cage has been removed, firmly hold the cork in your non dominant hand and the bottle in your dominant hand. Gently tilt the bottle to a horizontal position. Slowly twist the bottle, holding the cork stationary while gently returning the bottle to an upright position. The cork should slide out of the bottle with a gentle cough, not a loud pop. If you are concerned about sending the cork flying across the room, you may drape a cloth over the bottle before opening. Lastly, while sparkling wine can be enjoyed from whatever drinking vessel is handy (including red solo cup) it is traditionally enjoyed from either a coupe or a flute. The coupe is a wide flat bowl on a stem whereas the flute is a tall thin tapered cylinder on a stem. Both have advantages and disadvantages. 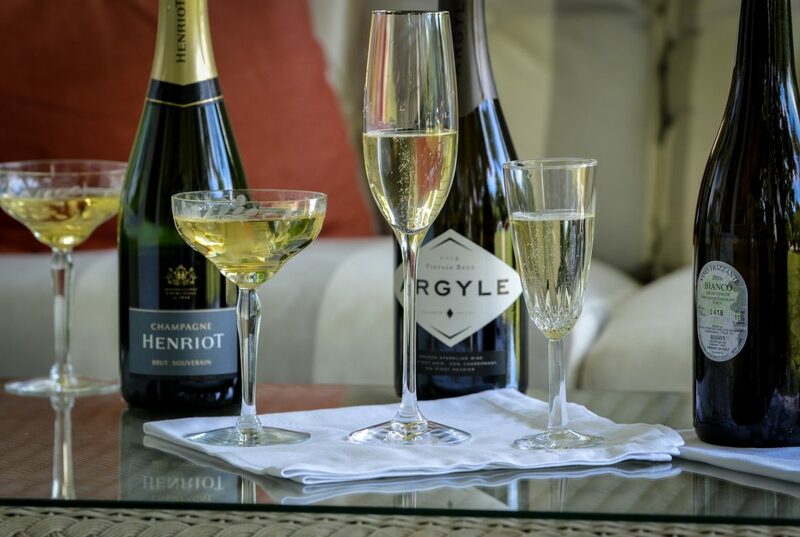 The coupe is classically stylish and allows for plenty of surface area to enjoy your bubbly. It can be a bit difficult to manage, especially if you are standing or walking, and the wine tends to lose its sparkle quickly. Flutes, on the other hand, have less surface area, keep the wine sparkling longer, and focus the aromas of the wine to your nose. It is, however, because of my nose that I prefer the coupe. I find that having a nose of reasonable proportion gets in the way of enjoying my bubbles in a flute.